One of my lessons in business was to focus. Another important one was to only go into a new venture slowly and doing due diligence. With my entrepreneurial background, both of these were hard for me to do. I also learned in my profession as an irrigation engineer that there were many variables that were not easy to define what caused what. Later as a sod farmer decisions were not clear cut. In having experience with 16 different ones and many managers, each manager did not want to be judged based on what another manager did in another market, climate and soil type. We went from the Big 8 comparison such as labor costs, fertilizer, seed, and irrigation to a Big 12 comparison. Then we looked at variables such as pumping depth to allow for differences for each farm. However, in the end, we made decisions based on our best knowledge as we continued to learn from over 40+ years of experience. In the same way, deciding on funding national missions thru evaluation and inspecting results is not easy. One can start out with giving the majority to mainly fund Americans on short term or long term trips. This is the road mostly easily traveled. But the rewards are likely much less than engaging and giving to equip national mission groups. Measuring what Matters is also very difficult. We try to determine if the national missions we support are multiplying churches based on making disciples. However, results given of both American and national mission groups can all be viewed with some skepticism. Also, after due diligence, I am less concerned about the $2,000 that may have been wasted on a national pastor than the $70,000 per year American who does not know the language nor the culture and does not always have reasonable supervision. As discussed in this site, counting raised hands at an invitation indicates little about making disciples unless there is good follow-up. 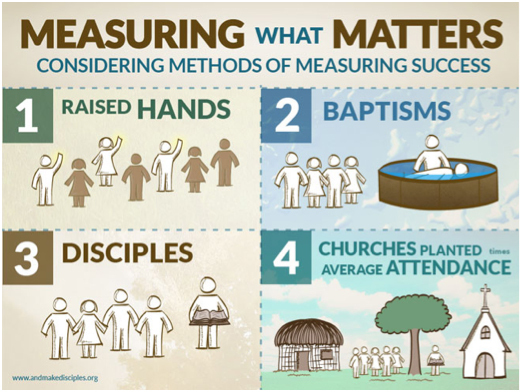 Counting baptism is more meaningful but less meaningful than counting disciples that are measured by Bible study, prayer time, church attendance and other ways. Another way may be to count churches and their average attendance. When I was an extension irrigation engineer, we had a story of a guy named Charlie. Charlie was a county agent getting an award for his achievements. He was asked while getting the award “Charlie, what makes you so successful?” He said “I see which way the crowd is going and then run in front of it with the flag.” Similarly, I see and read of American missionaries taking credit for God blessing the national missionaries’ work. Also in extension, we were very successful based on our evaluation of our own work. There is a natural tendency to justify the effectiveness of our own methods in spite of evidence to the contrary. Many number of results are inflated. For a short term group to claim many decisions for Christ is always questionable. Discipleship requires time for discipling, usually much more than two weeks. The nationals will raise their hands to please their guests, to get the gifts presented or to add to the many gods they already believe in. Some converts are counted two or more times by whoever may give them some Biblical teachings. The low hanging fruit for Americans is the 1,000,000 foreign students here most of which are never presented the gospel nor get into a Christian home. The other large US mission field is among the immigrants and refugees who come here with other beliefs.